As the name suggests, shape (round, princess, radiant, etc.) describes a diamond’s form, primarily as viewed from above. All diamond shapes have different attributes, but overall the beauty of the individual shapes is a matter of personal taste. Almost all diamonds have tiny inclusions. 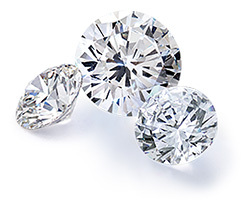 Diamonds with few or no imperfections receive the highest clarity grades. A diamond’s color grade actually refers to the lack of color. In other words, diamonds that are white, containing little or no color, receive higher quality grades than those with visible color. Unbiased diamond grading reports are offered with every diamond.